Bursar, Crescent University Abeokuta, Ogun State, Alhaji Jimoh Bankole, receiving a life time achievements award at the in recognition by University of Ibadan, Ibadan, Nigeria, on the sideline of the premier university's 70th Anniversary, recently. 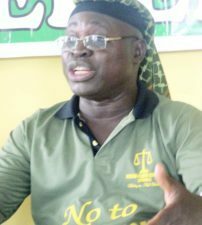 Bankola reminisced that he became acting bursar at a time when the University of Ibadan was in financial crisis to the tune of a billion naira, that all the debts were settled and by the time he was leaving office, the university had a surplus of nearly N3 billion. 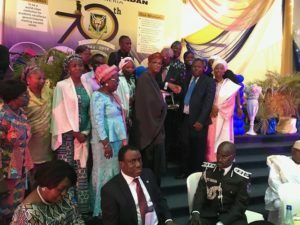 As part of activities marking its 70th Anniversary, the University of Ibadan, Nigeria has recognised the Bursar of Crescent University, Abeokuta, Alhaji Jimoh Bankole, with an “Award of Honour” in recognition of his lifetime achievements in education sector. 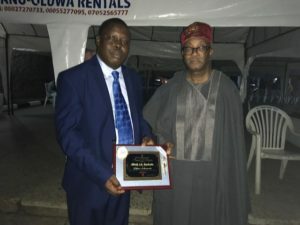 Alhaji Jimoh Bankole, supported by his boss, Vice Chancellor of Crescent University, Abeokuta, Professor Ibraheem Gbajabiamila, displaying the award. 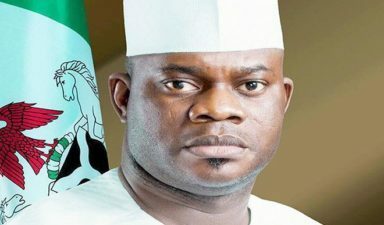 This was disclosed in a statement by Public Relations Officer (PRO), Crescent University Abeokuta, Ogun State, Mr. Idris Katib, copy of which was sent to The DEFENDER. 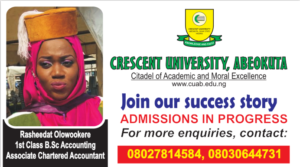 By this latest development, the Bola Ajibola-owned Crescent University will once again be on the noticeable side as similar positive achievements have tilted towards either the university directly, its staff or student. 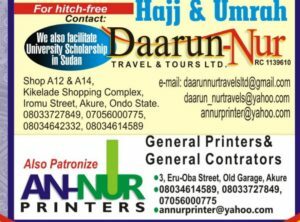 Alhaji Bankole’s current recognition coming from Nigeria’s premier university will go a long way proving the quality of staff at CUAB. Bankole received the award at the Trenchard Hall in the Central Administration quadrangle university campus in company of the Vice Chancellor of Crescent University, Abeokuta, Prof. Ibraheem Gbajabiamila. 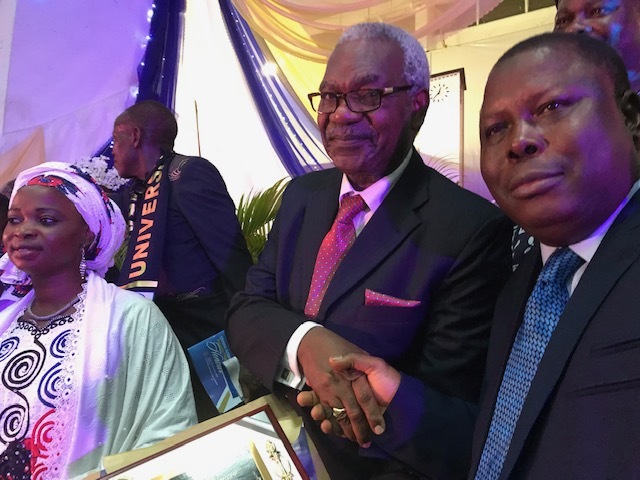 In a certificate of honour tagged “UI @70: Sustaining the Legacy, Raising the Bar”, signed and presented by the Vice Chancellor, Prof. Abel Olayinka, Alhaji Bankole was conferred with the award for his “lifetime achievements and commitment to service” by the premier university. 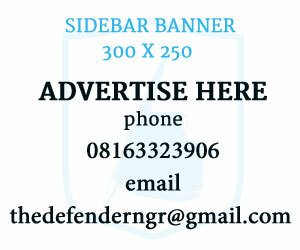 Bankole, who had also served as University of Ibadan Bursar between 1999 and 2009 after rising through the ladder, said it was gratifying to have received such an award from a prestigious institution such as UI “and that I am being honoured after about a decade of leaving office shows that all my labour to stabilise UI’s finances were not in vain. I feel so happy”. 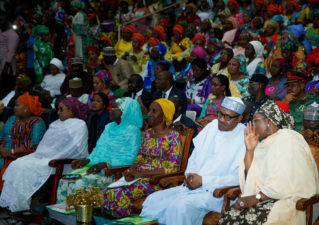 He reminisced that he became acting bursar at a time when the University of Ibadan was in financial crisis to the tune of a billion naira, that all the debts were settled and by the time he was leaving office, the university had a surplus of nearly N3 billion. Bankole being congratulated by VC CUAB, Professor Gbajabiamila, and other well wishers, during the award presentation at University of Ibadan, Ibadan, Oyo State, recently.